"Epithelial" cells lining the surfaces of organs have the intrinsic ability to remove potentially malignant cells from their midst. This is called the "epithelial defense against cancer" mechanism. Normally, the cells sense harmful cells and push them out by the process called cell competition. 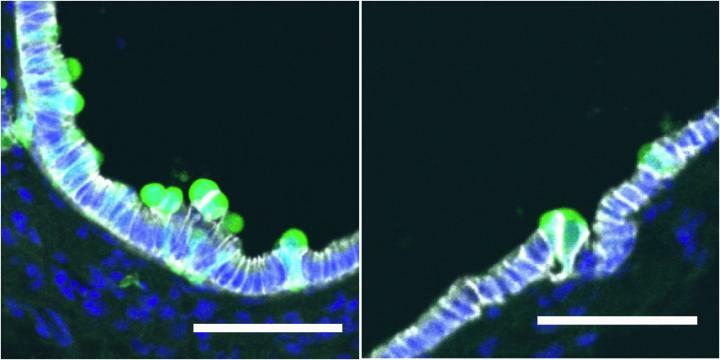 To study how obesity affects this defense mechanism, researchers from Hokkaido University and their collaborators bred mice that were designed to express a known cancer-inducing mutant protein called Ras. Epithelial cells usually remove the potentially malignant Ras-transformed cells. Feeding the Ras mice high-fat diets, which resulted in severe obesity, suppressed the defense mechanism and therefore increased the number of Ras-transformed cells remaining in the tissue. This suppression was seen in the intestine and pancreas, but not in the lungs. Furthermore, a month later the Ras-transformed cells developed a tumor in the pancreas of mice with the high-fat diet. The result supports previous correlations made between intestinal and pancreatic cancer and obesity, but not lung cancer. Following experiments using the mice model and cultured cells revealed that fatty acids and chronic inflammation cause the suppression of the defense mechanism. When mice fed a high-fat diet were treated with aspirin, known for its anti-inflammatory properties, the defense mechanism was substantially enhanced. This implies that reinforcing the epithelial defense mechanism with anti-inflammatory drugs could be utilized for cancer prevention. "This is the first report to show that obesity and chronic inflammation can influence competitive interaction between normal cells and transformed cells. It implies other factors such as infection, smoking, sleeping patterns and aging may also affect cell competition," says Yasuyuki Fujita of Hokkaido University who led the study.